Learn how to use Hadoop from beginner level to advanced techniques which is taught by experienced working professionals. 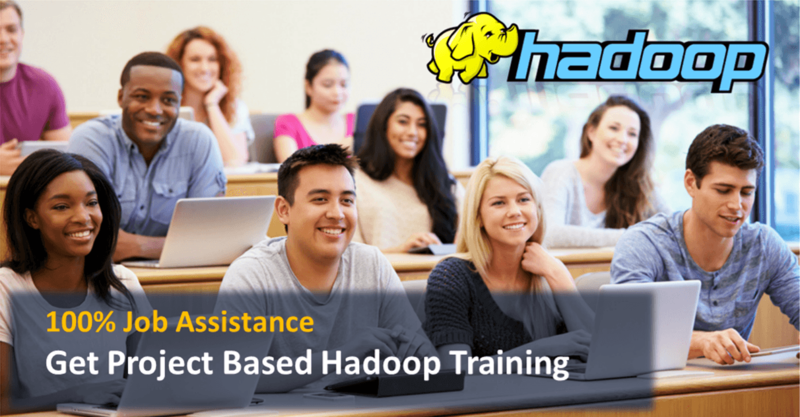 With our Hadoop Training in Chennai you’ll learn concepts in expert level with practical manner. Hadoop is a free, Java-based programming framework that supports the processing of large data sets in a parallel distributed computing environment. It is part of the Apache project sponsored by the Apache Software Foundation. Hadoop makes it possible to run applications on systems with thousands of nodes involving thousands of terabytes of data which is not feasible with traditional systems. Besant Technologies, No.1 Software (IT) Training Institutes. We offers best software training and placement in evergreen technologies like Database Developer Training, DBA Training, BI & Data Warehousing Training, Web Designing Training, Java Training, Software Testing Training, Microsoft Training, Oracle Applications Training, Mobile Applications Training, Oracle Fusion Middleware Training, Cloud Computing Training, IBM Training, Other Training and more to the students. We limit the batch size to provide very good interaction with each and every one. We are having dedicated team for the student’s placement assistance. By giving expert level trainers who are working in top MNC”s we do prepare the students for their job. Big Data represents the large and rapidly growing volume of information such as high-volume sensor data and social networking data from websites – Facebook and Twitter to name a few. Many Organizations are keen in capturing this data and analyzing the same as this can add immense value to make appropriate strategic decisions. However, it is important to note that such big data comes in many forms. It also has many different uses – real-time fraud detection, web display advertising and competitive analysis, call center optimization, social media and sentiment analysis, intelligent traffic management and smart power grids, and so on. All of these also involve growing volumes of structured, multi-structured, and unstructured data. The market for Big Data analytics is growing across the world and this strong growth pattern translates into a great opportunity for all the IT Professionals. Hadoop practitioners are among the highest paid IT professionals today with salaries ranging till $85K (source: indeed job portal), and the market demand for them is growing rapidly. Goal : In this module, you will understand Big Data, the limitations of the existing solutions for Big Data problem, how Hadoop solves the Big Data problem, the common Hadoop ecosystem components, Hadoop Architecture, HDFS, Anatomy of File Write and Read, how MapReduce Framework works. Objectives – Upon completing this Module, you should be able to understand Big Data is a term applied to data sets that cannot be captured, managed, and processed within a tolerable elapsed and specified time frame by commonly used software tools. Goal : In this module, you will understand Hadoop MapReduce framework and the working of MapReduce on data stored in HDFS. You will understand concepts like Input Splits in MapReduce, Combiner & Partitioner and Demos on MapReduce using different data sets. Objectives – Upon completing this Module, you should be able to understand MapReduce involves processing jobs using the batch processing technique. MapReduce can be done using Java programming. Hadoop provides with Hadoop-examples jar file which is normally used by administrators and programmers to perform testing of the MapReduce applications. MapReduce contains steps like splitting, mapping, combining, reducing, and output. Goal : This module will help you in understanding Hive concepts, Hive Data types, Loading and Querying Data in Hive, running hive scripts and Hive UDF. Objectives – Upon completing this Module, you should be able to understand Hive is a system for managing and querying unstructured data into a structured format. The various components of Hive architecture are metastore, driver, execution engine, and so on. Metastore is a component that stores the system catalog and metadata about tables, columns, partitions, and so on. Hive installation starts with locating the latest version of tar file and downloading it in Ubuntu system using the wget command. While programming in Hive, use the show tables command to display the total number of tables. Goal : In this module, you will learn Pig, types of use case we can use Pig, tight coupling between Pig and MapReduce, and Pig Latin scripting, PIG running modes, PIG UDF, Pig Streaming, Testing PIG Scripts. Demo on healthcare dataset. Objectives – Upon completing this Module, you should be able to understand Pig is a high-level data flow scripting language and has two major components: Runtime engine and Pig Latin language. Pig runs in two execution modes: Local mode and MapReduce mode. Pig script can be written in two modes: Interactive mode and Batch mode. Pig engine can be installed by downloading the mirror web link from the website: pig.apache.org. Goal : This module will cover Advanced HBase concepts. We will see demos on Bulk Loading, Filters. You will also learn what Zookeeper is all about, how it helps in monitoring a cluster, why HBase uses Zookeeper. Objectives – Upon completing this Module, you should be able to understand HBasehas two types of Nodes—Master and RegionServer. Only one Master node runs at a time. But there can be multiple RegionServersat a time. The data model of Hbasecomprises tables that are sorted by rows. The column families should be defined at the time of table creation. There are eight steps that should be followed for installation of HBase. Some of the commands related to HBaseshell are create, drop, list, count, get, and scan. Objectives – Upon completing this Module, you should be able to understand Sqoop is a tool designed to transfer data between Hadoop and RDBs including MySQL, MS SQL, Postgre SQL, MongoDB, etc. Sqoop allows the import data from an RDB, such as SQL, MySQL or Oracle into HDFS. Goal : Apache Flume is a distributed data collection service that gets the flow of data from their source and aggregates them to where they need to be processed. Objectives – Upon completing this Module, you should be able to understand Apache Flume is a distributed data collection service that gets the flow of data from their source and aggregates the data to sink. Flume provides a reliable and scalable agent mode to ingest data into HDFS. Goal : Hue is a web front end offered by the ClouderaVM to Apache Hadoop. Objectives – Upon completing this Module, you should be able to understand how to use hue for hive,pig,oozie. Serialization ensures avoidance of delay in reading or write operations. Reliability persists when an update is applied by a user in the cluster. Atomicity does not allow partial results. Any user update can either succeed or fail. Simple Application Programming Interface or API provides an interface for development and implementation. Objectives – Upon completing this Module, you should be able to understand ZooKeeper provides a simple and high-performance kernel for building more complex clients. ZooKeeper has three basic entities—Leader, Follower, and Observer. Watch is used to get the notification of all followers and observers to the leaders. Explain configuration of security parameters in Hadoop. Objectives – Upon completing this Module, you should be able to understand Hadoop can be optimized based on the infrastructure and available resources. Hadoop is an open-source application and the support provided for complicated optimization is less. Optimization is performed through xml files. Logs are the best medium through which an administrator can understand a problem and troubleshoot it accordingly. Hadoop relies on the Kerberos based security mechanism.